Nearly everything about Lake McConaughy is big! 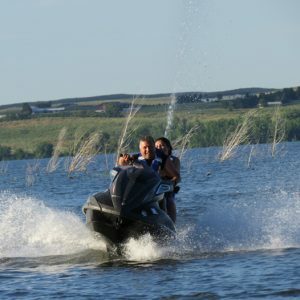 Its 35,700 surface acres make it Nebraska’s largest reservoir with over 100 miles of shore line. At full storage, McConaughy is 20 miles long, four miles wide and 142 feet deep at the dam. The dam is among the largest of its type in the world, and the fish grow to trophy proportions, accounting for several state records. Even its nickname, “Big Mac” reflects its giant stature. Located 8 miles northeast of Ogallala , NE , Lake McConaughy State Recreation Area is managed by the Nebraska Game and Parks Commission. To most Nebraskans and residents of neighboring states, McConaughy is known as a place for outdoor good times. Its blue water and white sand beaches provide the setting for many different kinds of outdoor recreation. Obviously such a fine piece of water offers excellent fishing and boating. But, Big Mac has become a favorite with campers, fishermen, hunters, sail boaters, water skiers, wind surfers, scuba divers, swimmers, ice boaters, and many other outdoor fun seekers. With over 35,000 surface acres this is the ideal place to catch Walleye, White Bass, Stripers, Wipers, Catfish, Small Mouth Bass, Northern Pike, Tiger Muskies and more. And with over 12,000 acres of prime habitat the hunting for Merriam Turkeys , Canadian and Snow Geese, Pheasants, Grouse, Quail, White Tail and Mule Deer, and a variety of ducks makes this a hunters haven. Fishing has long been the primary drawing card at Big Mac, with its cool, clear, deep waters. Game fish vary from sporty rainbow trout to the everyday catfish. Prized most highly by the local angler is the walleye, and Nebraska’s current state record of 16 lbs. 2 oz. came from Big Mac. Also top ranked is the white bass fishing. In recent years, a close relative of the white bass has been stocked, and the striped bass offers a tackle-busting contest an angler will not soon forget. Although smaller in size, the smallmouth bass provides some dynamite action. If wind curtails fishing, skiing, sailing and other water sports on the big lake, all is not lost. 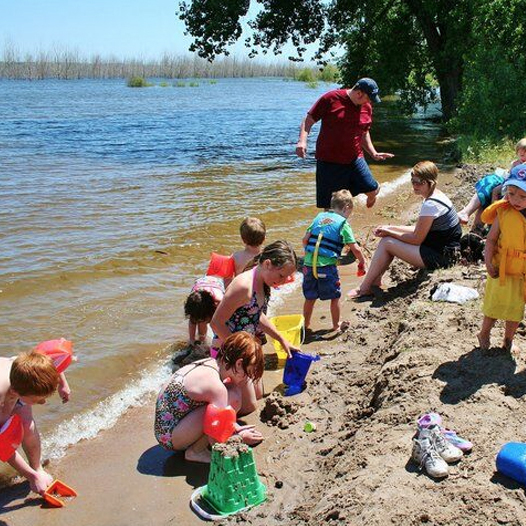 Situated just below Kingsley Dam, Lake Ogallala is an integral part of the Lake McConaughy recreation complex. Known as the “little lake”, it was formed when fill material was removed to build the dam. Lake Ogallala boasts some excellent fishing for rainbow and brown trout and yellow perch. The lake is 31/2 miles long and a quarter mile wide. It has about 5 miles of shore line and covers about 320 acres. There are also side trips to attractions in the region. Ash Hollow State Historical Park lies near the upper end of the lake on U.S. 26. The neighboring Sand hills offer unique scenery for a drive, perhaps to Arthur, just a half-hour north, or to Crescent Lake National Wildlife Refuge, north of Oshkosh, about 90 minutes away. Ogallala and other communities also offer interesting things to see or do. Come fall when campers, anglers, water skiers and other warm-weather sports enthusiasts pretty much abandon the lake, Big Mac becomes waterfowl hunting territory. Clear Creek Waterfowl Management Area at the west end of the lake attracts substantial numbers of Canada Geese, which can be hunted on the controlled shooting area, as well as much of the rest of the lake. Along with over 6,000 acres of wooded land, rolling hills, marshland, and wide-open fields this is the perfect hunting ground for Turkey, Deer, Pheasants, Duck and much more. Winter is an invitation to ice boaters, and backpackers, adding to the lakes year-round appeal. Below you will find information on some of the area’s interesting attractions.